A new study led by researchers at the University of California, Berkeley, represents a major advance in the understanding of the molecular mechanisms behind aging while providing new hope for the development of targeted treatments for age-related degenerative diseases. Older and fitter? New findings from a UC Berkeley-led study could have implications for the development of treatments for age-related degenerative diseases. Researchers were able to turn back the molecular clock by infusing the blood stem cells of old mice with a longevity gene and rejuvenating the aged stem cells' regenerative potential. The findings were published online on Jan. 31, in the journal Cell Reports. The biologists found that SIRT3, one among a class of proteins known as sirtuins, plays an important role in helping aged blood stem cells cope with stress. When they infused the blood stem cells of old mice with SIRT3, the treatment boosted the formation of new blood cells, evidence of a reversal in the age-related decline in the old stem cells' function. "We already know that sirtuins regulate aging, but our study is really the first one demonstrating that sirtuins can reverse aging-associated degeneration, and I think that's very exciting," said study principal investigator Danica Chen, UC Berkeley assistant professor of nutritional science and toxicology. "This opens the door to potential treatments for age-related degenerative diseases." Chen noted that over the past 10 to 20 years, there have been breakthroughs in scientists' understanding of aging. Instead of an uncontrolled, random process, aging is now considered highly regulated as development, opening it up to possible manipulation. "A molecular fountain of youth"
"Studies have already shown that even a single gene mutation can lead to lifespan extension," said Chen. "The question is whether we can understand the process well enough so that we can actually develop a molecular fountain of youth. Can we actually reverse aging? This is something we're hoping to understand and accomplish." Chen worked with David Scadden, director of the Center for Regenerative Medicine at Massachusetts General Hospital and co-director of the Harvard Stem Cell Institute. Sirtuins have taken the spotlight in this quest as the importance of this family of proteins to the aging process becomes increasingly clear. Notably, SIRT3 is found in a cell's mitochondria, a cell compartment that helps control growth and death, and previous studies have shown that the SIRT3 gene is activated during calorie restriction, which has been shown to extend lifespan in various species. To gauge the effects of aging, the researchers studied the function of adult stem cells. The adult stem cells are responsible for maintaining and repairing tissue, a function that breaks down with age. They focused on hematopoietic, or blood, stem cells because of their ability to completely reconstitute the blood system, the capability that underlies successful bone marrow transplantation. The researchers first observed the blood system of mice that had the gene for SIRT3 disabled. Surprisingly, among young mice, the absence of SIRT3 made no difference. It was only when time crept up on the mice that things changed. By the ripe old age of two, the SIRT3-deficient mice had significantly fewer blood stem cells and decreased ability to regenerate new blood cells compared with regular mice of the same age. What is behind the age gap? It appears that in young cells, the blood stem cells are functioning well and have relatively low levels of oxidative stress, which is the burden on the body that results from the harmful byproducts of metabolism. At this youthful stage, the body's normal anti-oxidant defenses can easily deal with the low stress levels, so differences in SIRT3 are less important. "When we get older, our system doesn't work as well, and we either generate more oxidative stress or we can't remove it as well, so levels build up," said Chen. "Under this condition, our normal anti-oxidative system can't take care of us, so that's when we need SIRT3 to kick in to boost the anti-oxidant system. However, SIRT3 levels also drop with age, so over time, the system is overwhelmed." To see if boosting SIRT3 levels could make a difference, the researchers increased the levels of SIRT3 in the blood stem cells of aged mice. That experiment rejuvenated the aged blood stem cells, leading to improved production of blood cells. It remains to be seen whether over-expression of SIRT3 can actually prolong life, but Chen pointed out that extending lifespan is not the only goal for this area of research. "A major goal of the aging field is to utilize knowledge of genetic regulation to treat age-related diseases," she said. Study co-lead author Katharine Brown, who conducted the research as a UC Berkeley Ph.D. student in Chen's lab, said SIRT3 has some potential in this regard. "Other researchers have demonstrated that SIRT3 acts as a tumor suppressor," said Brown. "This is promising because, ideally, one would want a rejuvenative therapy where you could increase a protein's expression without increasing the risk of diseases like cancer." The other co-lead author of this study is Stephanie Xie, a post-doctoral fellow at Massachusetts General Hospital's Center for Regenerative Medicine at the time of the study. Xie is now a post-doctoral fellow at the University of Toronto. A number of funding sources supported this study, including the Searle Scholars Program, the National Institutes of Health and the Siebel Stem Cell Institute. Naiman, a professor and chair of the Department of Applied Mathematics and Statistics in the university's Whiting School of Engineering, analyzed National Football League data from the modern era, which began in 1970. That was the first year when the league was divided into two conferences, the AFC and the NFC, with the playoff winners of each conference earning the right to compete in the Super Bowl. "I calculated the average point difference that occurred during each season whenever AFC and NFC teams played one another," Naiman said. "A 10-7 victory, for example, resulted in a three-point difference. I averaged these figures from AFC-versus-NFC games each year to try to determine which conference was 'stronger' in any given season." Analyzing 42 years of the modern era, Naiman found that there have been 22 instances in which the AFC had a stronger season; among these, the AFC team won the Super Bowl 13 of those times, that is, 59 percent of the time. In 20 instances, the NFC had a stronger season, and its team won the Super Bowl in 14 of those years, a winning percentage of 70 percent. Johns Hopkins University mathematician Daniel Naiman is a die-hard Baltimore Ravens fan. But what about the 2012 season, which will wrap up on Feb. 3 with the AFC's Ravens facing off against the NFC's San Francisco 49ers in New Orleans? Naiman has determined that in 2012, the NFC teams had their best year in knocking off AFC opponents since 1970, beating rival conference teams by an average of 5.6 points. Does that mean the Ravens are doomed? Not so fast, says Naiman, who calls himself a purple-bleeding die-hard Ravens fan. "This is just one curious pattern that might help in making predictions," he says, "and there are many other ways to slice and dice the football data." Moreover, he notes, there are several reasons why the Ravens cannot be counted out, starting with their recent underdog playoff victories against the Denver Broncos and New England Patriots. Beyond those wins, there is an interesting footnote from the first season of the modern football era, when, according to Naiman's review, the NFC appeared "super strong" in defeating its AFC rivals by an average of 7.8 points, the biggest such margin in the modern era. Nevertheless, the 1971 Super Bowl was won by Baltimore's AFC team at the time, the Colts, who clobbered the Dallas Cowboys, 16-13. On July 18, 2012, a fairly small explosion of light burst off the lower right limb of the sun. Such flares often come with an associated eruption of solar material, known as a coronal mass ejection or CME -- but this one did not. Something interesting did happen, however. Magnetic field lines in this area of the sun's atmosphere, the corona, began to twist and kink, generating the hottest solar material -- a charged gas called plasma -- to trace out the newly-formed slinky shape. The plasma glowed brightly in extreme ultraviolet images from the Atmospheric Imaging Assembly (AIA) aboard NASA's Solar Dynamics Observatory (SDO) and scientists were able to watch for the first time the very formation of something they had long theorized was at the heart of many eruptive events on the sun: a flux rope. Eight hours later, on July 19, the same region flared again. This time the flux rope's connection to the sun was severed, and the magnetic fields escaped into space, dragging billions of tons of solar material along for the ride -- a classic CME. More than just gorgeous to see, such direct observation offers one case study on how this crucial kernel at the heart of a CME forms. Such flux ropes have been seen in images of CMEs as they fly away from the sun, but it's never been known -- indeed, has been strongly debated -- whether the flux rope formed before or in conjunction with a CME's launch. This case shows a clear-cut example of the flux rope forming ahead of time. An Earth-directed coronal mass ejection (CME) on Jan. 31, 2013 was accompanied by a large prominence eruption best visible in light with a wavelength of 304 angstroms. NASA's Solar Dynamics Observatory captured this footage from 10 p.m. EST on Jan. 30, 2013, to 4 a.m. the next morning. In this video, the imaging cadence is one frame every 36 seconds. Experimental NASA research models, based on observations from the Solar Terrestrial Relations Observatory (STEREO) and ESA/NASA's Solar and Heliospheric Observatory, show that the CME left the sun at speeds of around 575 miles per second, which is a fairly typical speed for CMEs. Historically, CMEs at this speed are mild. Not to be confused with a solar flare, a CME is a solar phenomenon that can send solar particles into space and reach Earth one to three days later. Earth-directed CMEs can cause a space weather phenomenon called a geomagnetic storm, which occurs when they connect with the outside of the Earth's magnetic envelope, the magnetosphere, for an extended period of time. In the past, CME's such as this have caused auroras near the poles but didn't disrupt electrical systems on Earth or interfere with GPS or satellite-based communications systems. Medical illustrators and neurological imaging experts at Johns Hopkins have figured out how night-hunting owls can almost fully rotate their heads - by as much as 270 degrees in either direction - without damaging the delicate blood vessels in their necks and heads, and without cutting off blood supply to their brains. In what may be the first use of angiography, CT scans and medical illustrations to examine the anatomy of a dozen of the big-eyed birds, the Johns Hopkins team, led by medical illustrator Fabian de Kok-Mercado, M.A., a recent graduate student in the Department of Art as Applied to Medicine, found four major biological adaptations designed to prevent injury from rotational head movements. The variations are all to the strigid animals' bone structure and vascular network needed to support its top-heavy head. The team's findings are acknowledged in the Feb.1 issue of the journal Science, as first-place prize winners in the posters and graphics category of the National Science Foundation's 2012 International Science & Engineering Visualization Challenge. "Until now, brain imaging specialists like me who deal with human injuries caused by trauma to arteries in the head and neck have always been puzzled as to why rapid, twisting head movements did not leave thousands of owls lying dead on the forest floor from stroke," says study senior investigator and interventional neuroradiologist Philippe Gailloud, M.D. "The carotid and vertebral arteries in the neck of most animals - including owls and humans - are very fragile and highly susceptible to even minor tears of the vessel lining," adds Gailloud, an associate professor in the Russell H. Morgan Department of Radiology at the Johns Hopkins University School of Medicine. Sudden gyrations of the head and neck in humans have been known to stretch and tear blood vessel linings, producing clots that can break off and cause a deadly embolism or stroke. Researchers say these injuries are commonplace, often resulting from whiplashing car accidents, but also after jarring roller coaster rides and chiropractic manipulations gone awry. To solve the puzzle, the Johns Hopkins team studied the bone structure and complex vasculature in the heads and necks of snowy, barred and great horned owls after their deaths from natural causes. An injectible contrast dye was used to enhance X-ray imaging of the birds' blood vessels, which were then meticulously dissected, drawn and scanned to allow detailed analysis. The most striking team finding came after researchers injected dye into the owls' arteries, mimicking blood flow, and manually turned the animals' heads. Blood vessels at the base of the head, just under the jaw bone, kept getting larger and larger, as more of the dye entered, and before the fluid pooled in reservoirs. This contrasted starkly with human anatomical ability, where arteries generally tend to get smaller and smaller, and do not balloon as they branch out. Researchers say these contractile blood reservoirs act as a trade-off, allowing owls to pool blood to meet the energy needs of their large brains and eyes, while they rotate their heads. The supporting vascular network, with its many interconnections and adaptations, helps minimize any interruption in blood flow. "Our in-depth study of owl anatomy resolves one of the many interesting neurovascular medical mysteries of how owls have adapted to handle extreme head rotations," says de Kok-Mercado, now a scientific illustrator and animator at the Howard Hughes Medical Institute. Moreover, says Gailloud, "our new study results show precisely what morphological adaptations are needed to handle such head gyrations and why humans are so vulnerable to osteopathic injury from chiropractic therapy. Extreme manipulations of the human head are really dangerous because we lack so many of the vessel-protecting features seen in owls." The first anatomical variation they discovered was in the owl neck, where one of the major arteries feeding the brain passes through bony holes in the vertebrae. The hollow cavities were approximately 10 times larger in diameter than the vertebral artery traveling through it. The researchers say the extra space in the transverse foraminae, as the holes surrounding the vertebral arteries are known, creates a set of cushioning air pockets that allow the artery to move around when twisted. Twelve of the 14 cervical vertebrae in the owl's neck were found to have this adaptation. "In humans, the vertebral artery really hugs the hollow cavities in the neck. But this is not the case in owls, whose structures are specially adapted to allow for greater arterial flexibility and movement," says de Kok-Mercado. The team also found that the owl's vertebral artery enters the neck higher up than in other birds - going in at the owl's 12th cervical vertebrae instead of the owl's 14th cervical vertebrae - allowing for more vessel room and slack. Among de Kok-Mercado and Gailloud's other findings were small vessel connections between the carotid and vertebral arteries - not usually seen in adult humans - that allow blood to be exchanged between the two blood vessels. The researchers say these so-called anastomoses, including a vessel connection called a patent trigeminal artery, allow for uninterrupted blood flow to the brain, even if one route is blocked during extreme neck rotation. Researchers next plan to examine hawk anatomy to see if other bird species possess the same adaptive features for head rotation. Funding support for this study was provided by The Johns Hopkins Hospital and the Vesalius Trust for Visual Communication in the Health Sciences. Besides de Kok-Mercado and Gailloud, other Johns Hopkins researchers involved in this research were Michael Habib, Ph.D., Tim Phelps, M.A., and Lydia Gregg, M.A. According to a Johns Hopkins earth scientist, the hole in the Antarctic ozone layer has caused changes in the way that waters in those southern oceans mix – a situation that has the potential to alter the amount of CO2 in the atmosphere and eventually could have an impact on global climate change. In a paper published in this week's issue of the journal Science, Darryn W. Waugh and his team show that subtropical intermediate waters in the southern oceans have become "younger" as the upwelling, circumpolar waters have gotten "older" – changes that are consistent with the fact that surface winds have strengthened as the ozone layer has thinned. "This may sound entirely academic, but believe me, it's not," said Waugh, of the Morton K. Blaustein Department of Earth and Planetary Sciences at Johns Hopkins' Krieger School of Arts and Sciences. "This matters because the southern oceans play an important role in the uptake of heat and carbon dioxide, so any changes in southern ocean circulation have the potential to change the global climate." From those ocean measurements, Waugh's team was able to infer changes in how rapidly surface waters have mixed into the depths of the southern oceans. Because they knew that concentrations of CFCs at the ocean surface increased in tandem with those in the atmosphere, they were able to surmise that the higher the concentration of CFC-12 deeper in the ocean, the more recently those waters were at the surface. The inferred age changes – "younger in the subtropics, "older" nearer the South Pole -- are consistent with the observed intensification of surface westerly winds, which have occurred primarily because of the Antarctic ozone hole, suggesting that stratospheric ozone depletion is the primary cause of the changes in ocean ventilation. As stratospheric ozone recovers over the next 50 years, the changes in ventilation may slow or reverse. The impact of continued increases in greenhouse gases in the atmosphere will also need to be considered, however. The combined impact of the two factors on the southern oceans' ventilation and uptake of heat and carbon is an open question. Also on the research team were collaborators Francois Primeau of the University of California, Irvine; Tim Devries of the University of California, Los Angeles; and Mark Holzer of the University of New South Wales and Columbia University. Funding for the study was provided by the National Science Foundation and the Australian Research Council. Depletion of Antarctic ozone is a more important factor than increasing greenhouse gases in shifting the Southern Hemisphere jet stream in a southward direction, according to researchers at Penn State. "Previous research suggests that this southward shift in the jet stream has contributed to changes in ocean circulation patterns and precipitation patterns in the Southern Hemisphere, both of which can have important impacts on people's livelihoods," said Sukyoung Lee, professor of meteorology. According to Lee, based on modeling studies, both ozone depletion and greenhouse gas increase are thought to have contributed to the southward shift of the Southern Hemisphere jet stream, with the former having a greater impact. B, but until now, no one has been able to determine the extent to which each of these two forcings has contributed to the shift using observational data. "Understanding the differences between these two forcings is important in predicting what will happen as the ozone hole recovers," she said. "The jet stream is expected to shift back toward the north as ozone is replenished, yet the greenhouse-gas effect could negate this." Lee and her colleague, Steven Feldstein, professor of meteorology, developed a new method to distinguish between the effects of the two forcings. The method uses a cluster analysis to investigate the effects of ozone and greenhouse gas on several different observed wind patterns. "When most people look at ozone and greenhouse gases, they focus on one wind pattern, but my previous research suggests that, by looking at several different but similar patterns, you can learn more about what is really happening," said Feldstein. In their study, the researchers analyzed four wind patterns. The first wind pattern corresponded to an equatorwarda shift of the midlatitude westerlies toward the equator. T; the second pattern also described an equatorward shift, but included a strong tropical component. T; the third pattern corresponded to a poleward shift of the westerlies toward the South Pole with a weakening in the maximum strength of the jet; and the. The fourth pattern corresponded to a smaller poleward jet shift with a strong tropical component. In addition to their novel inclusion of more than one wind pattern in their analysis, the scientists investigated the four wind patterns at very short time scales. "Climate models are usually run for many years; they don't look at the day-to-day weather," said Feldstein. "But we learned that the four wind patterns fluctuate over about 10 days, so they change on a time scale that is similar to daily weather. This realization means that by taking into account fluctuations associated with the daily weather, it will be easier to test theories about the mechanism by which ozone and greenhouse gases influence the jet stream." The researchers used an algorithm to examine the relationship between daily weather patterns and the four wind patterns. They found that the first wind pattern -- which corresponded to an equatorward shift of the midlatitude westerlies -- was associated with greenhouse gases. They also found that the third pattern -- which corresponded to a poleward shift of the westerlies -- was associated with ozone. The other two wind patterns were unrelated to either of the forcings. The researchers found that a long-term decline in the frequency of the first pattern and a long-term increase in the frequency of the third pattern can explain the changes in the Southern Hemisphere jet stream. "Ozone had the bigger impact on the change in the position of the jet stream," said Lee. "The opposite is likely true for the Northern Hemisphere; we think that ozone has a limited influence on the Northern Hemisphere. Understanding which of these forcings is most important in certain locations may help policy makers as they begin to plan for the future." In addition to finding that ozone is more important than greenhouse gases in influencing the jet-stream shift, the scientists also found evidence for a mechanism by which greenhouse gases influence the jet-stream shift. They learned that greenhouse gases may not directly influence the jet-stream shift, but rather may indirectly influence the shift by changing tropical convection, or the vertical transfer of heat in large-scale cloud systems, which, in turn, influences the jet shift. The researchers currently are further examining this and other possible mechanisms for how greenhouse gases and ozone influence the jet stream as well as Antarctic sea ice. The results will appear in the Feb. 1 issue of the journal Science. "Not only are the results of this paper important for better understanding climate change, but this paper is also important because it uses a new approach to try to better understand climate change; it uses observational data on a short time scale to try to look at cause and effect, which is something that is rarely done in climate research," said Feldstein. "Also, our results are consistent with climate models, so this paper provides support that climate models are performing well at simulating the atmospheric response to ozone and greenhouse gases." The National Science Foundation funded this research. When the solar wind nearly breaks off, our neighbour's ionosphere expands into space. In rare events, the sheath of electrons and ions enveloping Venus in a height of 150 to 300 kilometres can expand into space like a tail. This exceptional deformation occurs on the planet’s night side, when the solar wind, the flow of charged particles from the Sun, nearly comes to a stop. Scientists under the lead of the Max Planck Institute for Solar System Research (MPS) were now for the first time able to study such an event in detail. Their analysis is based on data obtained by instruments on board ESA's spacecraft Venus Express. The results may help to understand, whether particles in our solar system can travel from one planet to another – for example from Venus to Earth. Gas trail in space: under normal conditions, Venus is surrounded by an ionosphere at a height of 150 to 300 kilometres. The induced magnetic fields – outlined here by yellow lines – bind it close to the planet. When the solar wind gets very weak, the ionosphere can expand into space. A kind of plasma tail is created (right) on the planet's night side. On August 3 and 4, 2010 the Sun held its breath: After several heavy coronal mass ejections, the solar wind, the continuous flow of electrons and protons from the Sun, almost completely broke off for approximately 18 hours. In this phase, only 0.2 particles per square centimetre reached Venus. After Mercury, Venus is the second closest planet to the Sun. On normal days, this value is approximately 25 to 50 times higher. "Phases with such weak solar wind are rare, but occur time and again", says Markus Fränz from the Max Planck Institute for Solar System Research. "However, the event in August 2010 was the first one since the launch of the space probe Venus Express seven years ago", he adds. Due to the spacecraft's pronounced elliptical orbit around Venus, the researchers had the chance to study the processes triggered by the weak solar wind in the planet’s atmosphere. As is Earth, Venus is surrounded by an ionosphere, a sheath consisting of electrons and ions. Scientists refer to this as a plasma. The charged particles are created on the planets’ day sides when ultraviolet light with extremely short wavelengths and X-rays enter the outer layers of the atmospheres. On Earth, the particles are trapped by the strong magnetic field forcing them to rotate together with the Earth (and its magnetic field) around the Earth's axis. In this way, they reach the planet’s night side thus forming a complete and spherical layer. "On Venus, this is completely different", says Yong Wei from the MPS, the new paper's lead author. "Venus not only lacks a magnetic field of its own. She also rotates much slower", he adds. For one rotation Venus takes a little more than 224 Earth days. Nevertheless, one can observe an ionosphere on Venus' night side. "Measurements performed by older space probes have shown electrons and ions flowing from the day side to the night side", says Fränz. This flow is driven by the high plasma pressure on the day side. Like a compressed gas escaping from a pressure cylinder, the plasma travels from a region with high pressure to one with lower pressure. ESA’s spacecraft Venus Express has been studying our neighbour since 2006. With the help of the magnetometer MAG and the instrument ASPERA-4 (Analyser of Space Plasmas and Energetic Atoms) on board Venus Express, the researchers were able to take a closer look. They found that in events of weak solar wind Venus' ionosphere is not magnetized. Under normal conditions, these induced magnetic fields bind the charged particles of the ionosphere close to the planet. When the solar wind breaks off, however, the ionosphere in the region between the day and night side can expand. "The charged particles can therefore reach the night side more easily and in greater number", says Fränz. There, a sort of plasma balloon is created that extends into space like a tail. The whole ionosphere thus takes on a tear-shaped form. The new measurements prove that the night side ionosphere protrudes approximately 15 000 kilometres into space. "But the tail could be much longer. It might measure up to millions of kilometres", says Wei. Since Venus Express' flight route did not lead the spacecraft directly behind the planet however, this question cannot be answered conclusively. It is also still unclear, whether the ionosphere of Venus can in principle expand far enough to reach Earth. In 1996 researchers from MPS were able to detect plasma from Venus close to our planet. They analysed data obtained by the spacecraft SoHO that circles the Sun in line with the Earth. Perhaps the processes now observed by their colleagues from MPS offer an explanation for such events. "Possibly phases with tenuous solar wind allow particles to travel from planets close to the Sun to those further away", says Wei. A recent discovery funded by the Air Force Office of Scientific Research (AFOSR) may very well lead to a process that not only benefits every uniformed service member of the Department of Defense, but everyone else as well: protection from Chemical/Biological agents, to self-cleaning apparel, to effortless thermal management, to fuel purification as well as enhanced control of leaks—especially oil and fuels. In 2006, AFOSR Program Manager Dr. Charles Lee funded Professor Gareth McKinley at the Massachusetts Institute of Technology exploring nanocomposite technology for Defense applications. Anish Tuteja, an MIT doctoral student at the time, was exploiting the unusual surface properties of a nanocomposite with fluorinated nanoparticles, to create a superoleophobic surface. After graduation, Tuteja moved to University of Michigan in Ann Arbor, where he is currently an assistant professor of materials science and engineering, specializing in chemical engineering and macromolecular science and engineering. He was awarded a Young Investigator Program grant from AFOSR in 2011, and continued to conduct the same line of research begun at MIT. His team also included doctoral student Shuaijun Pan and postdoctoral researcher Arun Kota, as well as collaboration with Dr. Joseph Mabry, from the Rocket Propulsion Division of the Air Force Research Laboratory, at Edwards AFB, California. In their latest paper, "Superomniphobic Surfaces for Effective Chemical Shielding," in the current issue of the Journal of the American Chemical Society, Tuteja and his team have demonstrated surfaces that effectively perform as "chemical shields against virtually all liquids." To make this possible, surfaces are prepared using a nanoscale coating that is approximately 95 percent air, which in turn, repels liquids of any material in its class, causing them to literally bounce off the treated surface. The surfaces "possess hierarchical scales of re-entrant texture that significantly reduce the solid−liquid contact area." It all comes down to controlling how much contact the liquid ultimately has with the treated surface. To accomplish that the researchers apply the nanoscale coating using a process called electrospinning—using an electric charge to create fine particles of solid derived from a liquid solution. The coating is a mixture of cross-linked "polydimethylsiloxane," or PDMS, and liquid-resisting nanoscale cubes developed by the Air Force that contain carbon, fluorine, silicon and oxygen. While the material's chemistry is important, so is its texture, because it hugs the pore structure of whatever surface it is applied to, and creates a fine web of air pockets within those pores, so any liquid that comes in contact with the coating is barely touching a solid surface. According to Dr. Tuteja, when an untreated surface and a liquid get in close proximity, "they imbue a small positive or negative charge on each other, and as soon as the liquid comes in contact with the solid surface, it will start to spread….we've drastically reduced the interaction between the surface and the droplet." By effectively eliminating the contact between the treated surface and the liquid, there is almost no incentive for the liquid to spread, as such, the droplets stay intact, interacting only with molecules of themselves, and maintaining their spherical shape. The research team has tested more than 100 liquids and found only two that were able to penetrate the coating: they were both chlorofluorocarbons—chemicals used in refrigerators and air conditioners. In Tuteja's lab demonstrations the surface repelled coffee, soy sauce and vegetable oil, as well as toxic hydrochloric and sulfuric acids, and the surfaces are also resistant to gasoline and various alcohols. This program is of particular interest to the Air Force and the Department of Defense, as it can be useful for self-cleaning surfaces (in particular, integral breathable protective Chemical/Biological Warfare defense in uniform clothing and sensor systems), improvement of thermal management efficiency in phase change cooling systems, fuel purification and the control of oil and fuel leakages in rockets and airplanes. Not to mention, protection against the everyday coffee spill. The disk surrounding the young star TW Hydrae is regarded as a prototypical example of planetary nurseries. Due to its comparatively close proximity of 176 light-years, the object plays a key role in cosmological birth models. Using the Herschel Space Telescope, researchers including Thomas Henning from the Max Planck Institute for Astronomy in Heidelberg have, for the first time, determined the mass of the disk very precisely. The new value is larger than previous estimates and proves that planets similar to those of our solar system can form in this system. In addition, the observations are an example of how, in the world of science, not everything can be planned for. The birthplace of planets: New measurements that Thomas Henning from the Max Planck Institute for Astronomy in Heidelberg assisted in carrying out have resulted in a greater mass for the disk of gas and dust surrounding the young star TW Hydrae than previously assumed. The illustration depicts an artist’s conception of the disk. Where Egyptologists have their Rosetta Stone and geneticists their Drosophila fruit flies, astronomers studying planet formation have TW Hydrae: A readily accessible sample object with the potential to provide foundations for an entire area of study. TW Hydrae is a young star with about the same mass as the Sun. It is surrounded by a protoplanetary disk: a disk of dense gas and dust in which small grains of ice and dust clump to form larger objects and, eventually, into planets. This is how our Solar System came into being more than 4 billion years ago. What is special about the TW Hydrae disk is its proximity to Earth: at a distance of 176 light-years from Earth, this disk is two-and-a-half times closer to us than the next nearest specimens, giving astronomers an unparalleled view of this highly interesting specimen – if only figuratively, because the disk is too small to show up on an image; its presence and properties can only be deduced by comparing light received from the system at different wavelengths (that is, the object's spectrum) with the prediction of models. In consequence, TW Hydrae has one of the most frequently observed protoplanetary disks of all, and its observations are a key to testing current models of planet formation. That's why it was especially vexing that one of the fundamental parameters of the disk remained fairly uncertain: The total mass of the molecular hydrogen gas contained within the disk. This mass value is crucial in determining how many and what kinds of planets can be expected to form. Previous mass determinations were heavily dependent on model assumptions; the results had significant error bars, spanning a mass range between 0.5 and 63 Jupiter masses. The new measurements exploit the fact that not all hydrogen molecules are created equal: Some very few of them contain a deuterium atom – where the atomic nucleus of hydrogen consists of a single proton, deuterium has an additional neutron. This slight change means that these "hydrogen deuteride" molecules consisting of one deuterium and one ordinary hydrogen atom emit significant infrared radiation related to the molecule's rotation. The Herschel Space Telescope provides the unique combination of sensitivity at the required wavelengths and spectrum-taking ability ("spectral resolution") required for detecting the unusual molecules. The observation sets a lower limit for the disk mass at 52 Jupiter masses, with an uncertainty ten times smaller than the previous result. While TW Hydrae is estimated to be relatively old for a stellar system with disk (between 3 and 10 million years), this shows that there is still ample matter in the disk to form a planetary system larger than our own (which arose from a much lighter disk). On this basis, additional observations, notably with the millimetre/submillimetre array ALMA in Chile, promise much more detailed future disk models for TW Hydrae – and, consequently, much more rigorous tests of theories of planet formation. The observations also throw an interesting light on how science is done – and how it shouldn't be done. Thomas Henning explains: "This project started in casual conversation between Ted Bergin, Ewine van Dishoek and me. We realized that Herschel was our only chance to observe hydrogen deuteride in this disk – way too good an opportunity to pass up. But we also realized we would be taking a risk. At least one model predicted that we shouldn't have seen anything! Instead, the results were much better than we had dared to hope." TW Hydrae holds a clear lesson for the committees that allocate funding for scientific projects or, in the case of astronomy, observing time on major telescopes – and which sometimes take a rather conservative stance, practically requiring the applicant to guarantee their project will work. In Henning's words: "If there's no chance your project can fail, you're probably not doing very interesting science. TW Hydrae is a good example of how a calculated scientific gamble can pay off." A new way of measuring the mass of supermassive black holes could revolutionise our understanding of how they form and help to shape galaxies. The technique, developed by a team including Oxford University scientists, can spot the telltale tracer of carbon monoxide within the cloud of gas (mostly hydrogen) circling a supermassive black hole at the centre of a distant galaxy. By detecting the velocity of the spinning gas they are able to 'weigh' (determine the mass) of the black hole. An image of NGC 4526 showing molecular gas. Detailed information on supermassive black holes, thought to be at the heart of most galaxies, is scarce: it has taken 15 years to measure the mass of just 60. The problem is that most other supermassive black holes are too far away to examine properly even with the Hubble Space Telescope. The new method, when combined with new telescopes such as ALMA (Attacama Large Millimetre/submillimetre Array), promises to extend this black hole 'weigh-in' to thousands of distant galaxies. It will also enable the study of black holes in spiral galaxies (similar to our own Milky Way), which are hard to target using currently available techniques. A report of the research is published in this week's Nature. The team demonstrated the new technique on the supermassive black hole at the centre of a galaxy, NGC 4526, in the constellation of Virgo. NGC 4526 was chosen as a test because it has been widely studied but the team believe the technique will work on a wide range of different galaxies. Prehistoric period of human history distinguished by the development of the most primitive stone tools discovered, and covers roughly 99% of human technological prehistory. Neolithic period marks with the rise of farming, which produced the "Neolithic Revolution", and ending when metal tools becoming widespread in the Copper Age (chalcolithic) or Bronze Age developing directly into the Iron. 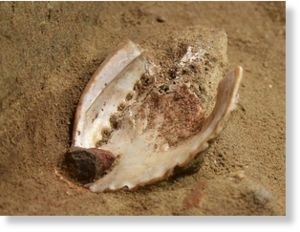 These discoveries are all paleolithic and come prior to the rise of farming. 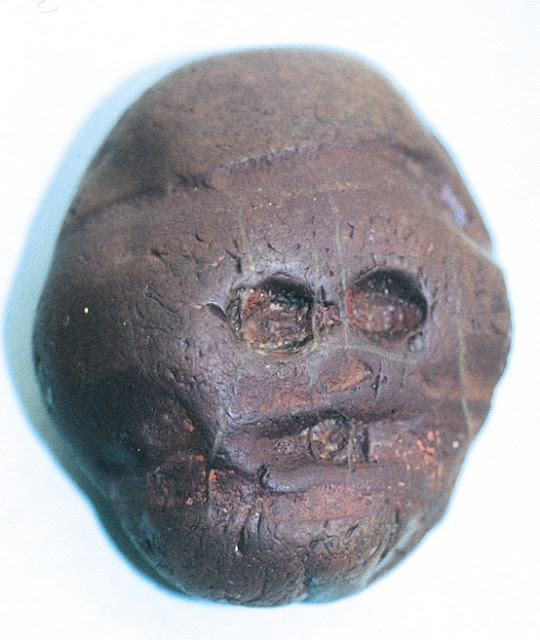 First known "art" object: water worn pebble resembling a human face, from Makapansgat, South Africa, ca. 3,000,000 BCE. Reddish brown jasperite, approx. 2 3/8" wide. Abalone Shell Credit: Science/AAAS Archaeologists in South Africa uncovered two 100,000-year-old abalone shells and assorted bones and stones that served a toolkits to make some sort of ochre-based compound. The mixture may have been used as a paint or adhesive. It's the oldest evidence of humans making a complex compound, and even the oldest evidence of humans using containers. 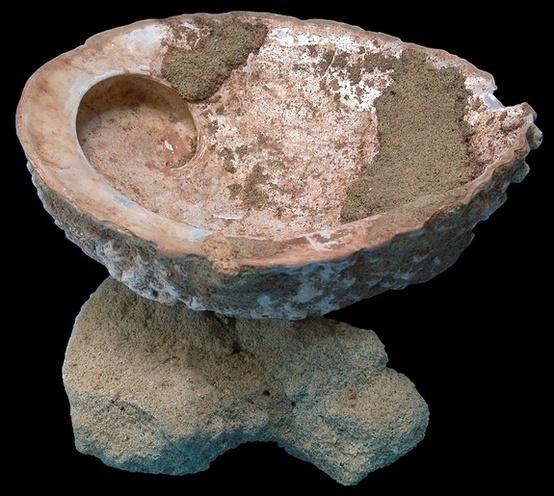 "A coating of bright red powder on the insides of a pair of 100,000-year-old abalone shells is evidence of the oldest known art workshop, a new study says. The powder was found inside two shells in Blombos Cave near Still Bay, South Africa (map). The substance is the dried remains of a primitive form of paint made by combining colorful clay called ochre, crushed seal bones, charcoal, quartzite chips, and a liquid, such as water. " "The oldest known bedding - sleeping mats made of mosquito-repellant evergreens that are about 77,000 years old - has been discovered in a South African cave. 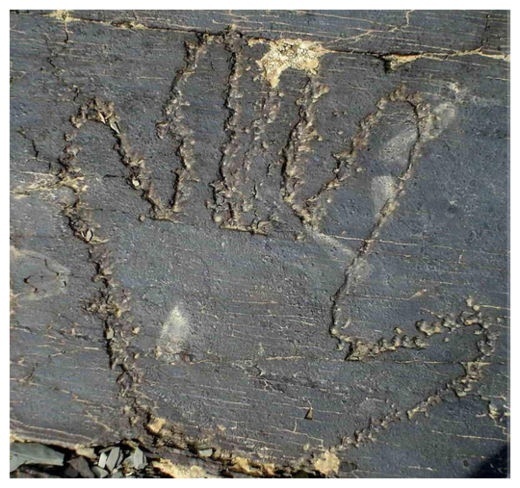 This use of medicinal plants, along with other artifacts at the cave, helps reveal how creative these early peoples were, researchers said"
"The photo shows a rock bearing one of the 40,000-year-old hand pattern engravings, which have recently been discovered in the Teimareh region near the city of Khomein in Central Province." 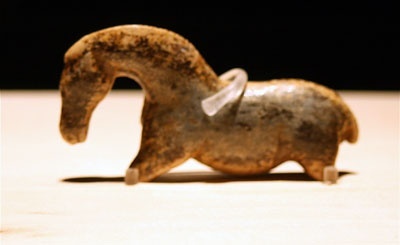 Ivory carving of Horse, Vogelherd cave, Germany, from about 33,000 BCE. 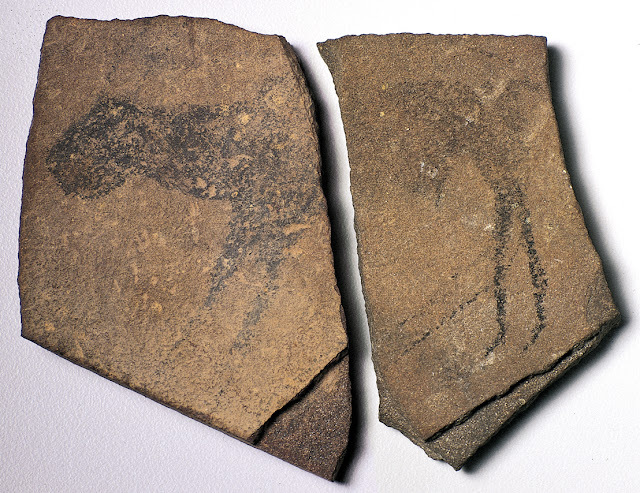 Some of the oldest art ever found. Lion Man dated 32,000 BC. Upper paleolithic. 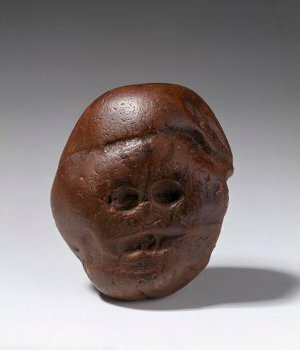 Lionheaded Figurine discovered in a cave in Germany. From circa 30,000 BC. Paleolithic Art, Roucadour cave Themines, Quercy, Lot, France. 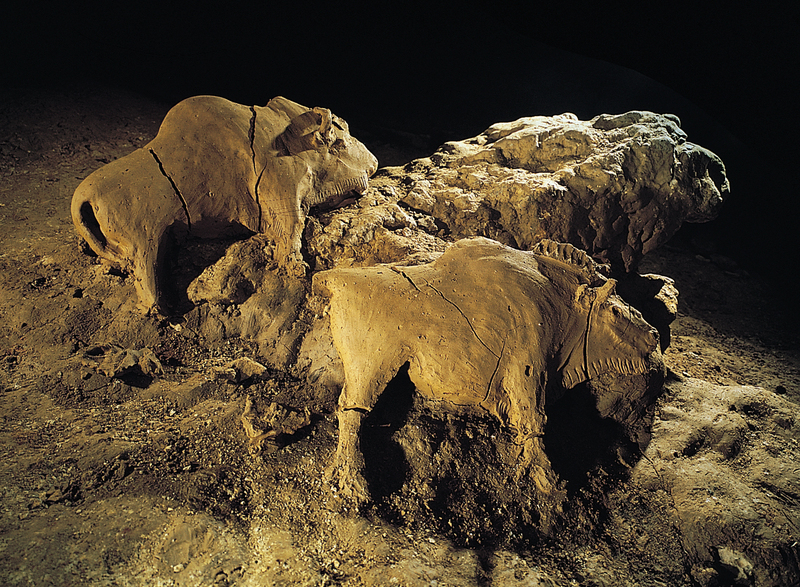 Attributed to the oldest phase of Paleolithic Art in Quercy, c. 28,000-24,000 years BP. All known prehistoric sites that have been discovered, have trails that lead to near and distant hematite deposits. Historians have deduced that the impetus behind all mining activities was a need for ochre pigments. 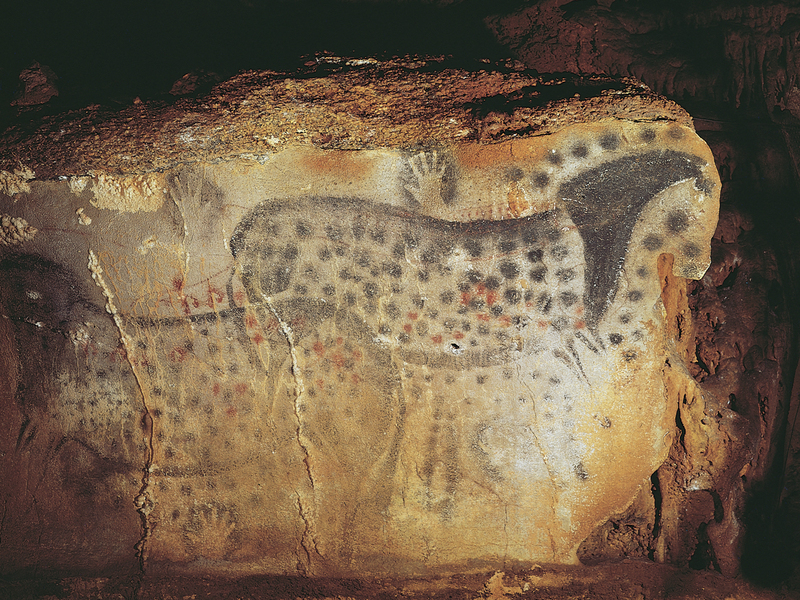 Cave dwellers might have traveled as far as 25 miles to obtain iron earth pigments for their paint in the Lascaux area. 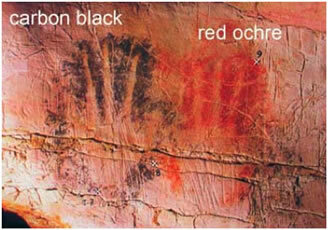 The first paintings were cave paintings. Ancient peoples decorated walls of protected caves with paint made from dirt or charcoal mixed with spit or animal fat. Articulated figure, also made of mammoth ivory; around 26,000 years old. Found near Brno in the Czech Republic, was buried beside the body of a man in his 40s. "The ivory figurine has a strange spectral face," says Jill Cook, of British Museum, "while at the bottom of head, there is a little hollow that would have allowed head to rotate. Similarly, its arms could have come up & down. The legs – which are missing – probably did the same. As to its purpose? This was a puppet, the world's oldest." Woman holding a bison horn, from Laussel, Dordogne, France, ca. 25,000-20,000 BCE. Painted limestone, approx. 1' 6" high. Musée d'Aquitaine, Bordeaux. Animal facing left, from the Apollo 11 Cave, Namibia, ca. 23,000 BCE. Charcoal on stone, approx. 5" X 4 1/4". State Museum of Namibia, Windhoek. Prehistoric art, "22,000 B.C. ", mammoth Ivory, Malta settlement, Siberia. Spotted horses and negative hand imprints, wall painting in the cave at Pech-Merle, Lot, France, ca. 22,000 BCE. Approx. 11'2" long. The State Hermitage Museum: Collection Highlights,prehistoric art, Bird Figurine, Mammoth Ivory, Malta settlement, ca. "22,0000 B.C. Venus de Lespuge, 19.000 B.C. Two bison, reliefs in cave at Le Tuc d'Audoubert, Ariège, France, ca. 15,000-10,000 BCE. Clay, each approx. 2' long. Horse heads, Chauvet Cave. Fourteen different animal species are depicted in the Chauvet Cave. Here, three horses' heads face one another. Venus of Hohle Fels. Woolly mammoth tusk. Venus figurine found in 2008 near Schelklingen, Germany. It is dated to between 35.000 & 40000 years ago. 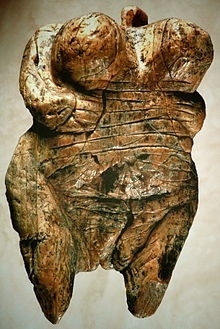 It is the oldest undisputed example of Upper Paleolithic art and figurative prehistoric art in general. Venus of brown ivory (ca. 27,000/20,000 BCE) found in the caves of Balzi Rossi, on the border between Liguria and France. 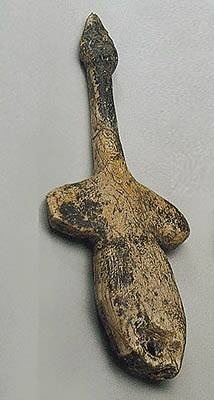 It's a nearly complete female figurine made from partially fossilized ivory and measures about 7 cm (2.63 inches) high. 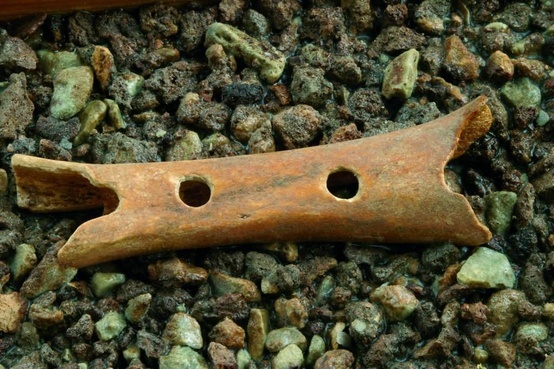 The Native American flute has been reported to be the third oldest known musical instrument in the world, with bone flutes dating back over 60,000 years. 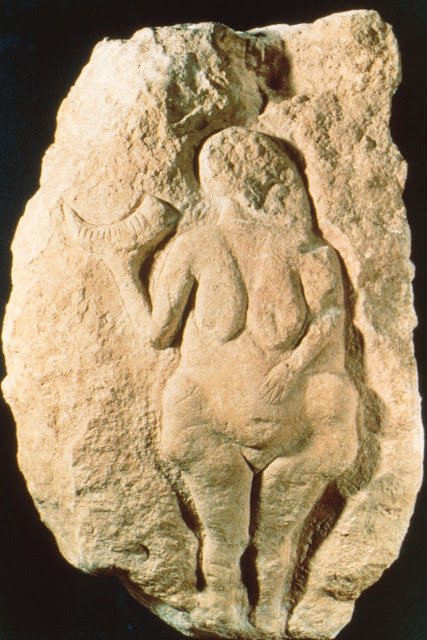 Venus of Dolni Vestonice (26,000 BCE). Oldest ceramic work of prehistoric art ever discovered. What Do Beer, Dogs, And Soy Sauce Have In Common? Why Are Japanese Cartoons A Global Hit? Global Warming Less Extreme Than Feared? Titan Gets A Dune "Makeover"